Capturing and taming the relentless pace of time is watchmakers’ daily goal. Bulgari’s interpretation of this quest incorporates the values upheld by the venerable House ever since its founding: technicality, originality, refinement, creativity, poetry… This range of parameters is now perfectly blended within two creations now enriching the Bulgari Daniel Roth collection: the Grande Lune and Papillon models. 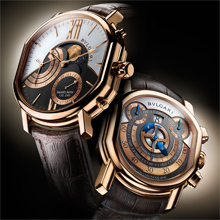 While astronomical and chronograph functions have become common occurrences on the contemporary watchmaking scene, the Bulgari Grande Lune and Bulgari Papillon Chronograph models are anything but commonplace and feature a level of sophistication and creativity evidenced in both the mechanism itself and in the dial displays. The real lunar cycle lasts 29 days, 12 hours, 44 minutes and 2.8 seconds, an extremely accurate duration that watchmakers have sought to reproduce as accurately as possible. In the vast majority of cases, the micromechanical transcription of moon-phases generally comprises two complementary moving parts: the first wheel and pinion performs a complete rotation in 24 hours, while the disc carrying the moon is equipped with 59 teeth and displays the lunar-cycle in 29 days and 12 hours. Compared with the actual lunar orbit, the difference in time accumulated by this construction thus amounts to 44 minutes and 2.8 seconds per month. After exactly 32 months, this device thus leads to a one-day discrepancy compared with the celestial reality and therefore requires manual adjustment. In the case of an astronomical moon-phase display, better known by enlightened amateurs as a high-precision moon phase, the construction itself achieves enhanced precision by complementing the first wheel and pinion with a 7-toothed star and a 135-toothed moon disc. The first performs a rotation in 24 hours, the 7-toothed star rotates in 7 days, and the disc bearing the moon displays an extremely accurate lunar cycle of 29 days, 12 hours and 45 minutes – thus reducing the precision error to just 57.2 seconds per cycle. After the first year, the discrepancy amounts to 11 minutes and 26.4 seconds, which means it is not until more than a century later – 125 years in fact – that this high-precision mechanism will need to be manually adjusted. Positioned on a depiction of the night sky, the central fine gold-coated moon is revealed through an asymmetrical opening topping the extremely original seconds indication. 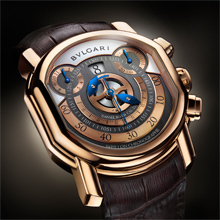 The latter – a signature feature of the Bulgari Daniel Roth Collection – is composed of three arms of varying lengths spinning on a single axis and respectively covering three 20-second segments. The dial displays the date on a graduated circle subdial, and the lunar cycle and date functions are easily adjusted using the two corrector pushpieces on the side of the slender elliptical rose gold case. The entire set of functions is driven by the generously sized 15’’’ DR Calibre 2300, a Lépine-type mechanical hand-wound Frédéric Piguet movement enriched with an exclusive Daniel Roth complication. The seconds hand is positioned along the same axis as the winding-stem. The movement is entirely hand-decorated and boasts exceptional finishing including a circular-grained mainplate, chamfered and polished bridges featuring Côtes de Genève decorative motif, as well as polished screw heads. 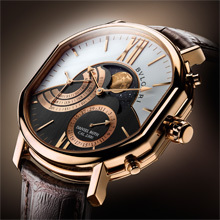 This resolutely high-end mechanism is housed in a simple 44 mm-diameter elliptical case crafted in 18-carat rose gold and water-resistant to 30 metres, topped by a split-level dial featuring white-lacquered and black gold satin-brushed surfaces, along with 18-carat rose gold-coated hands and hour-markers. The Grande Lune model is fitted with an alligator leather strap equipped with a rose gold pin buckle. A resolutely original approach to short-time measurement lends the Papillon Chronograph a truly distinctive face. The exceptional arrangement of the various items of information on the dial, as well as their actual read-off, endows it with an exclusive style bearing no relation to customary chronographs. The dial centre of this exceptional creation features the minutes read off via an ingenious mechanical device positioned on a bearing disc. The latter performs a complete 360° rotation in two hours and carries two independent pivoting lozenge-shaped hands that in turn glide across a 180° segment with a graduated scale running from 00 to 60 minutes. While one of them, which we will call hand A, is positioned on the semi-circular segment with its tip pointing to the minutes, hand B remains retracted almost throughout the disc rotation. When the former reaches the 55th minute on the display segment, the latter extends through a gradual quarter-turn to take up its position parallel to hand A on the 00 minute indication. And as soon as the minutes restart from zero, hand A progressively retracts and remains so for the following 55 minutes. This sophisticated movement is treated to excellent finishing including circular graining on the mainplate and chronograph bridge, as well as Côtes de Genève adorning the bridge of the self-winding mechanism. All the bridges are chamfered and polished, as are the screw heads. The visible steel movement parts are satin-brushed, chamfered and polished. The calibre is housed within a slightly cambered and extremely comfortable double-ellipse case in rose gold that is water-resistant to 30 metres. A domed glareproofed sapphire crystal protects the split-level dial graced with alternating white-lacquered and black gold satin-brushed surfaces – the exclusive and appealing signature feature of the Bulgari Collection driven by Daniel Roth calibres. The Papillon Chronograph model is fitted with an alligator leather strap equipped with a triple-blade rose gold folding clasp. Displays: Hours, minutes, three-armed small seconds hand rotating across three 20-second segments; central astronomical moon-phase disc; pointer-type date display on a circular subdial.